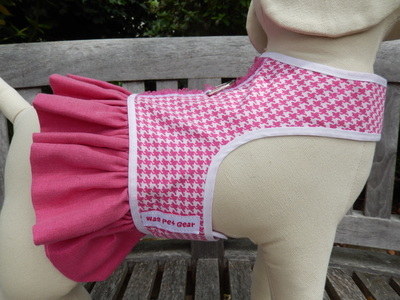 Girl's Harnesses from WagPetGear - Wag Pet Gear! a pink and white herringbone body with a sparkly pink ruffle. This light blue flowery harness is covered with white daisies and scattered with multi-colored daisies. It has a white daisy trim piece on the back. The ruffle is yellow with tiny white polka dots. 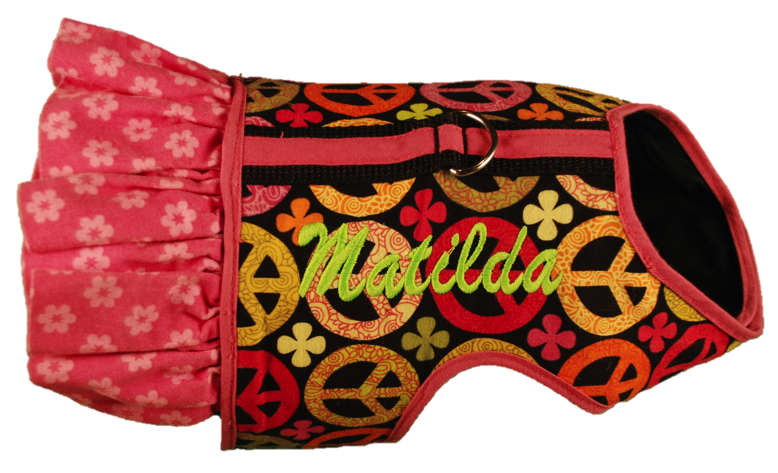 This brightly colored, cheerful harness will have you and your pet smiling. It has a turquoise background with white daisies with red centers. The ruffle is red with white polka dots. This harness is pale pink and brown camo. It is trimmed in brown and has brown trim with pink flowers down the back. The body of this harness is a black and white geometric print. It has white trim with black flowers down the back. If you choose the ruffle it is black with small white polka dots. 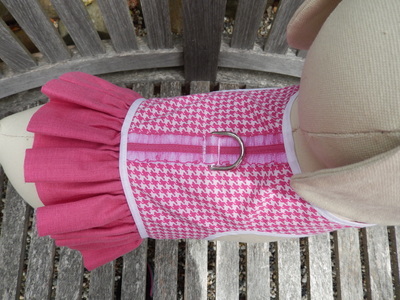 If you want your pet to have Parisian flair this harness is for you. 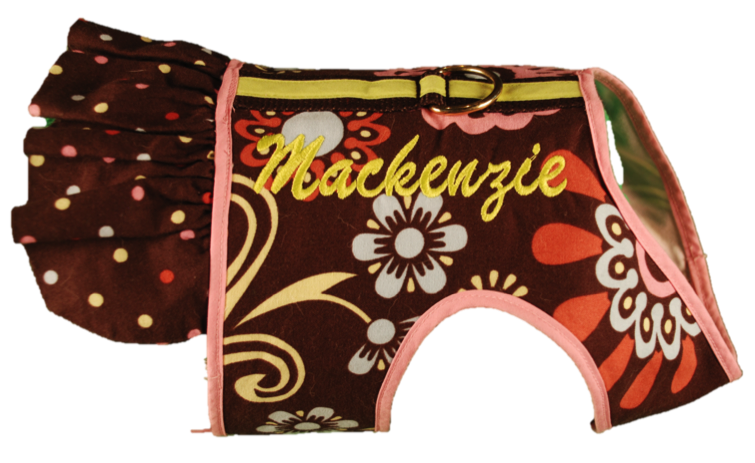 It has an off white background with a bright pink print and matching pink trim. Look closely and you'll see the Eiffel Tower. 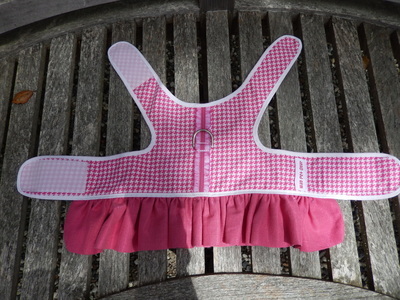 This pink and blue plaid harness will make your girl look sweet and innocent. It has ribbon with pink hearts down the back and is trimmed in blue. Perfect for your country girl. 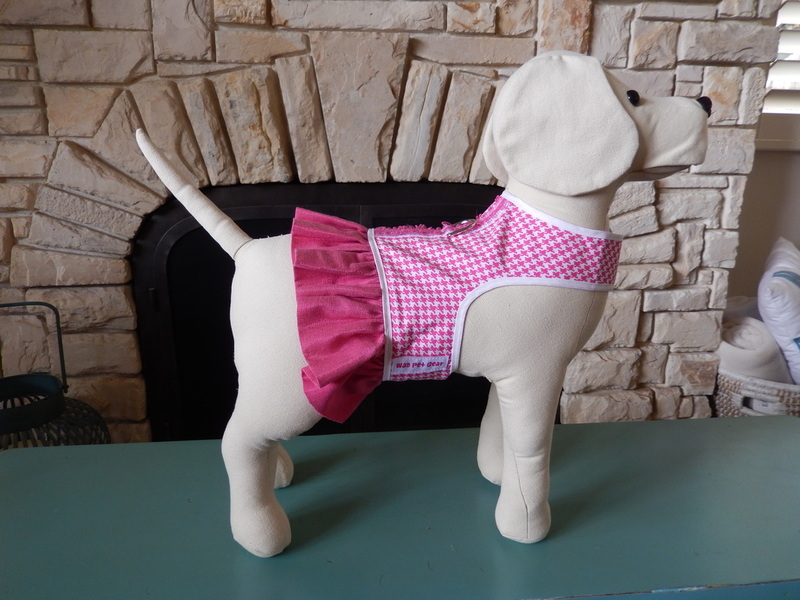 This denim harness comes with either a red or yellow bandana ruffle or a pink ruffle with flowers. You will need to pick your favorite color when ordering. This harness has a brown background with pastel colored flowers. The ruffle is also a brown background with matching pastel polka dots. 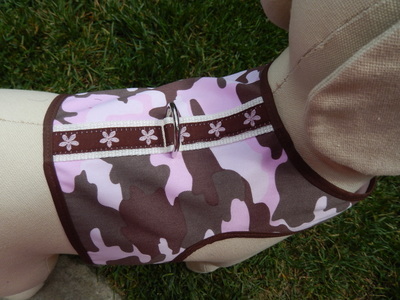 Your pet will be living on the wild side in this harness. 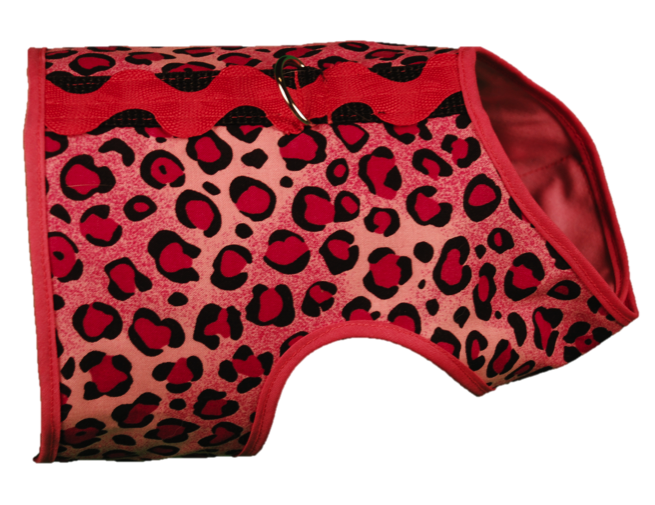 It is a lighter pink background with bright pink and black leopard print. 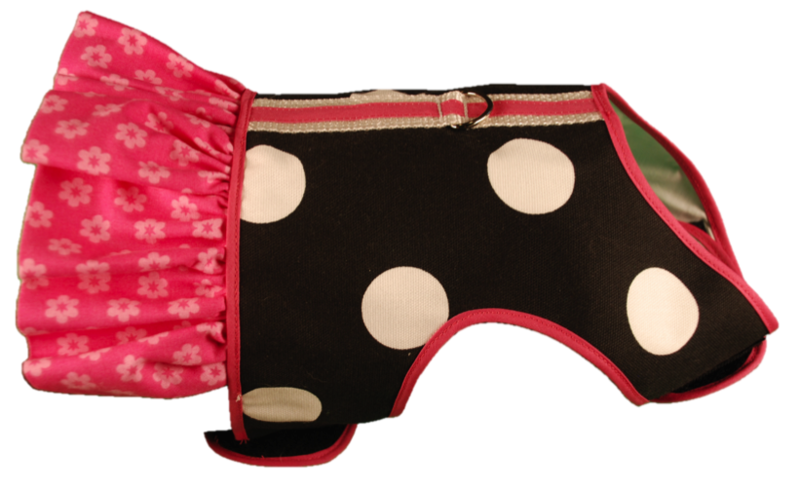 It can have a black with white polka dot ruffle added. 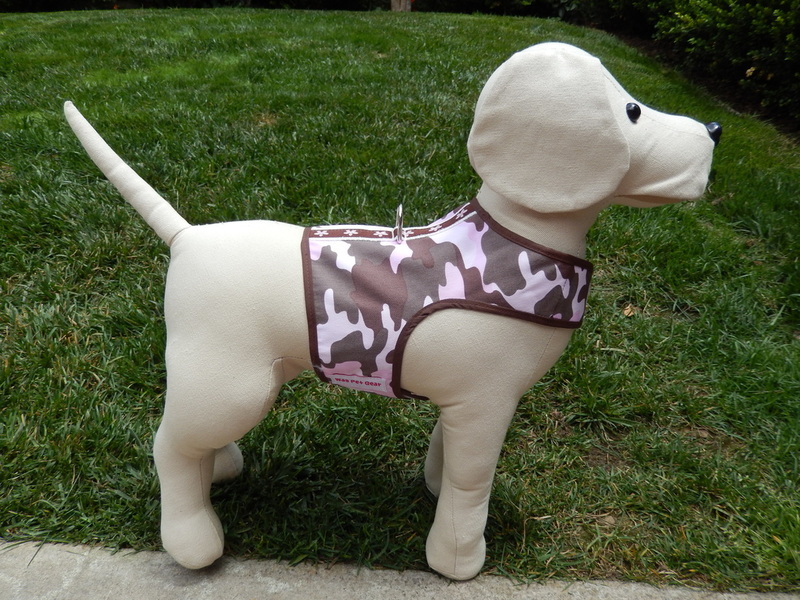 This adorable harness is perfect for the winter months. 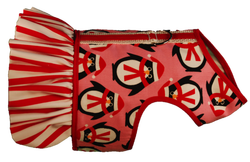 It has a bright pink background with festive penguins. The ruffle is red and white striped. This harness will take you back to the 60's. 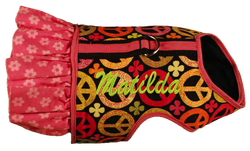 It is a black background with bright orange, pink, yellow and green peace signs and a pink ruffle. It coordinates perfectly with the pink Flower Child leash. If you love polka dots, this is the harness for your pet! It is black with large white polka dots. The ruffle is pink with pink flowers. 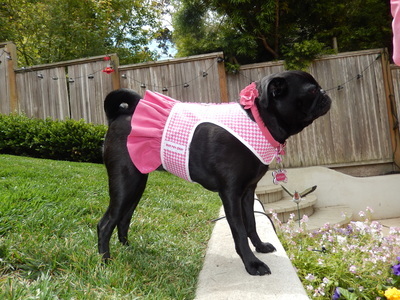 This harness also coordinates with the pink Flower Child leash. 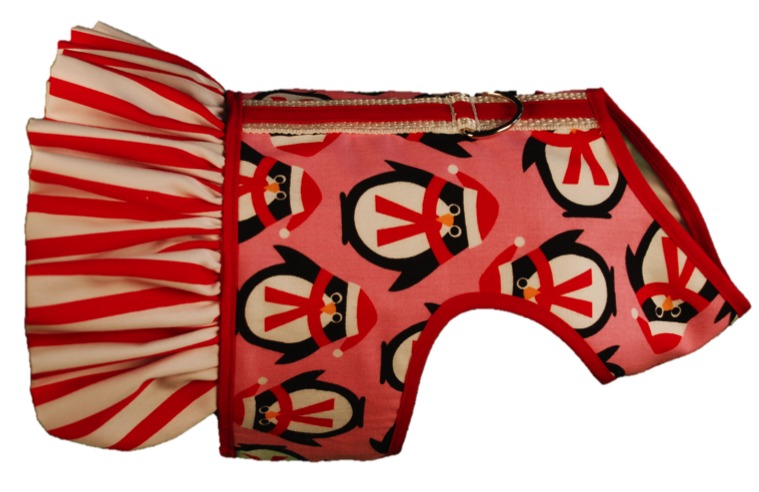 This brightly colored harness will get your pet noticed! 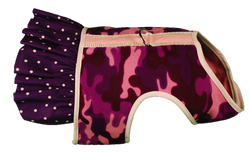 The body is pink and purple camo. The ruffle is purple with white polka dots. 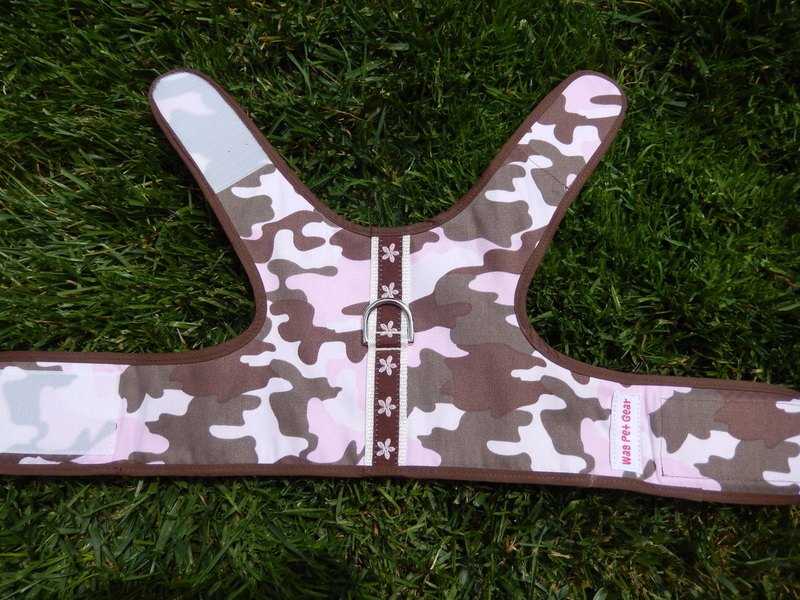 This harness for your special cowgirl has a light blue background with a cowboy print. 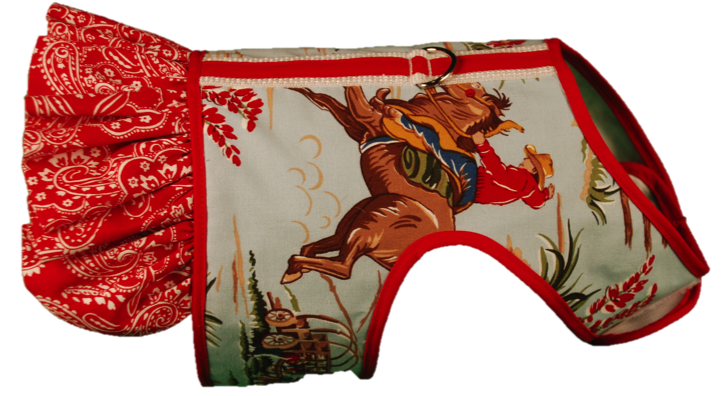 The ruffle is red 'bandana' fabric. 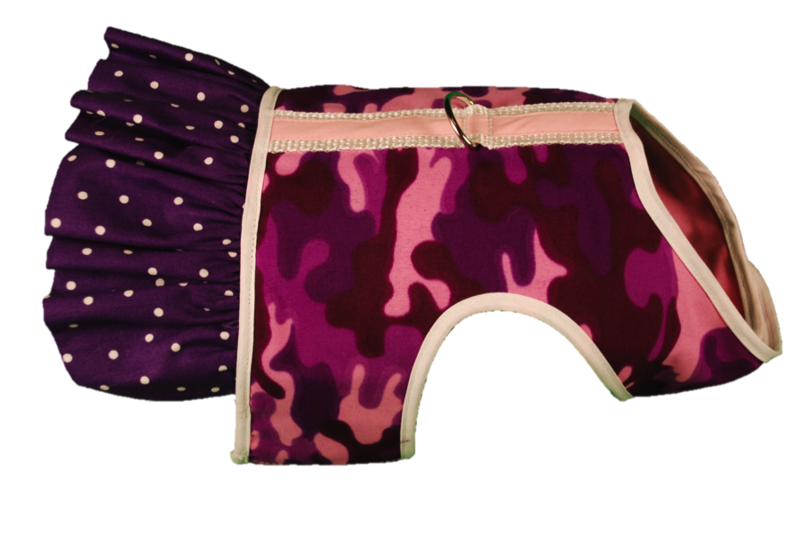 This pink with white polka dot harness with black trim down the back will make your pet feel special!